The following parents received no compensation in any form for their statements. They share the results obtained from implementing the Connections movements into their child's daily routing. "We no longer see any more symptoms of ADHD that our daughter had in the spring and she is completely off her medication. Her teachers don't see any more symptoms either. Shannon no longer gets up out of her desk in class and her impulsivity is gone. She had zero focus last year, but this year is a different story. My daughter has improved by 2 letter grades in all of her subjects and even made the honor roll! "These movements are the reason why our 11 year old daughter is no longer exhibiting any signs of ADHD and is off of methylphenidate (an ADHD medication). THIS WORKS!" Shelly W.
"We now have peace in our home. This was the best money we ever spent." Deb W.
"Our daughter went from taking 90 minutes to put on her shoes and sock to doing it in 2 minutes - only after 1 week of the Connections movements. We can't thank you enough!" Eileen K.
"After only 3 weeks of doing the Connections exercises, my 4 year old daughter has completely stopped her extreme nuclear meltdowns! After 4 months, they are still gone!" Kira T.
"We've attended several seminars and programs for our son who has special needs and Connections is by far the best. It answers so many questions and give us a plan that is easy to follow and integrate into our day. We are so excited!" Last year, getting my son to do his homework was like pulling teeth. We attended the Connections seminar and started doing the movements. This year, he wants to get ahead by doing several days assignments and is extremely motivated! We credit Connections for this change in our son. M. & G. H.
This Occupational Therapist's son is changing already! She writes ..."I went to the seminar a few weeks ago in Richmond. My 5 year old was having difficulty in school with focus, he would zone out and not participate. He was unable to finish his work, and follow through with directions. Writing and reading was a struggle, and he started to dread going to kindergarten." "I started with the Connections exercises the first night. There are changes already! This week we received a note home from his teacher that said "I am so proud of Eddie! He is like a different child lately. He is showing confidence and trying so hard. He wants to read all the time and is showing progress." This was a big change from the notes we have been receiving. So thank you!" Saturday night "Katie" and her siblings had a friends spend the night. So Sunday morning we had five 6 & 7 year olds at our home. She was late getting to bed the night before because the children's school had a Halloween party. Sunday morning all 5 children were up, 4 of them watching television, as Katie, totally on her own, closed the door between where they were and her "study area" and proceeded to do her daily homework. She did all this on her own and stuck with the homework until it was done. What 7 year old child who is known for her nuclear meltdowns, especially when she is tired, abandons her siblings and friends as they are watching television, to go do homework? None that I have ever know. My 7 yr. son and 6 yr. daughter both improved in their Irish dancing ability. They looked pretty awkward and didn't stay with the music in late January. When I saw them dance again in March, their timing and ability had greatly improved. Sam is still a work in progress, but his body positions have improved dramatically. He holds his head up instead of bent over. His writing skills and socials skill need to be developed now that they can be, and it seems his motivation to work has improved." "Last December, Amanda (10) was in self contained school day/special education classes. Amanda's issue were all behavioral. We were determined to get her in the general ed environment because we knew the isolation from her peers and the core curriculum was stagnating her academic and social growth and she deserved to be included. We began the Connections movements in late January. The workshop was fascinating. I set up a list of the exercises and began doing them each night. It become a little chat time for us." "Within the first week of doing the Connections movements, things started to click for Amanda. One of the first responses from school was that Amanda "finally skipped across the gym today." That may not seem like a lot but the adapted PE teachers at two different school had been trying to get this goal reached for over a year. I just smiled when I read the note because I knew the connections were beginning to happen. From then on day after day behavior reports were showing 100% good behavior!" "During the previous school year, 2012 - 13, Amanda was in crisis at the school and in the settle area everyday. By years end we had to change schools because she was so distraught. But this year she was more than on track. By the end of 2013-14 school year, she was full day in all General Ed classes and having lunch with a girls group. She had a great summer." "Due to family circumstances Amanda was at home alone quite a bit this summer. But, SHE decided that she would make the most of this time. Each day she made a schedule for herself for lunch, reading and writing time. She began writing a mini-novel. Each day consistently she completed her morning routine, made her own lunch and kept up with her reading and writing. All of this from the child that the previous school stated "she refuses to write her assignments and requires assistance from a one on one aide to remain on task and in self control". And now to begin 2014-15 year she will start the day in a real homeroom class and follow the day with science, history, specials, recess, lunch and all the normal things kids do during the school day! She will only have self contained math because that is still a struggle. We are excited about the new school because we truly have a new start with so many positives....thanks to Connections! "﻿"Much of his OCD has subsided and he is calmer in other aspects, so thank you!" Jennifer C﻿. "Let's just wait until your child gets older, he is still too young. "I couldn't wait. A mother's intuition is too powerful to ignore. My son is two and a half. I knew something was wrong because he understood me but two or three words would come out only by chance. He would express himself with sounds and a few sign language signs I had taught him. He tried to tell me things but it was only gibberish. I attended the Connections seminar. I began doing some fun activities and exercises presented on the seminar and POP!!! Like a cork exploding out of a wine bottle, my son began using his words. His brain had made some connections. We are even playing pretend. He is using his imagination. We still have a long road to go, but waiting was not an option. Ladies and gentleman, moms and dads, grandmas and grandpas, this seminar was made to show you something so simple and yet fascinating about your developing children. Virginia and Steve Largent will show you how to make that POP!!! in your child's brain. They say a child's laughter could simply be one of the most beautiful sounds in the world, and I agree, but for me it was hearing my son say "mommy" for the first time. - Gloria D.
The exercises my daughter has been doing in relation to brain connections have made a significant improvement in our quality of life. We discovered my daughter had motion sickness when she was an infant, which has been a challenge for all travel. And as she got older we also discovered she had problems climbing down stairs because she could not spatially figure out where her feet were going to land. Stairs entailed anxiety and panic which caused frustration for her and all of us as well. After doing the exercises, she no longer has ANY car sickness and is able to easily climb down stairs no problem. Thank you, Virginia for consolidating all the myriad of information out there and making it palatable for us parents. And for making practical exercises we can use in our everyday lives with our children. --Dana, Very Satisfied Parent"
From C. Cross: "We started doing the exercises, both morning and evening, about 8 weeks ago with our 4, almost 5 year old, son. At first, we did just 5-8 minutes each session as Mikey was not agreeable to more. Slowly, we increased the time and currently do about 15 minutes each session. We also modified his diet to included largely fresh, organic and non-GMO foods. While changing his diet did produce a slight change in his behavior, the exercises we have incorporated led to even more changes. Here are some of the gradual changes we have noticed over the weeks. " 1. We will be transitioning out of pull-ups and into underwear for night time as he is now able to make it through the night w/out an accident. 2. My picky eater, who had about 5 meals he would eat, is interested in trying new foods and we have added 4 new meals to his rotation. 3. He used to wake up every night in the middle of the night, but now it is probably 2 times out of 7. 4. He sits at the table 5 out of 7 nights and eats w/out getting up and moving around. 5. Mikey used to wake up in the morning crying and angry. Now he wakes up and quietly comes into bed and snuggles. 6. He is interested in learning his ABCs. 7. He is listening better. While I still need to repeat things more times to him than his siblings, it is considerably less than what it was earlier in the year. 8. He apologizes, spontaneously, when he’s done something wrong. 9. There is not an argument over everything (bathroom, getting dressed, putting on shoes, etc….) Mikey still argues about some things, but not everything! 10. Mikey is getting dressed on his own, at least some of the time, where before he would not do it at all. 11. According to teacher he is listening better in class, standing in line with other kids, and sitting still longer than he was before. "Before the Connections exercises, Tommy took 35-40 minutes for his math homework, was only assigned half of what the rest of his classmates received, was on all day ADHD meds, still couldn't concentrate, and got C's and D's in math. We started doing the Connections exercises. In only a few months, his math homework takes 15 minutes, he is tasked with the full assignment received by his classmates, has no afternoon ADHD meds (Dr reduced them 50%!! ), concentrates completing ALL of his homework and is getting A's not only in math but everything else too!" Grace H.
“Let me tell you all the success we have had using the Connections movements! The biggest thing is that she and I have a real relationship now! That block in her brain that kept her from attaching is broken! We giggle and cuddle and hug - eye contact! And adult interaction! She uses her words and boy are they articulate! I get a trip out of her expressing herself - she is clear and direct when expressing her feelings! We have only had one "RAD" melt down (where she shuts down) since we have started these but when she had that we were able to snap her out of it and move on positively like it never happened! Usually it was days of coming out of it. And we have been exposed to a lot of her "triggers" with no effect! She accepts and submits to discipline as a moral conviction now - not victimizing herself or fighting against it which I think comes from the communication barrier being lifted. Her flight, fight and freeze is so much more rational now! She reacts appropriately to her environment and when she is aroused with fear or anger etc., she is able to calm down and move on! That's huge for her! She conquers a play ground, hiking paths and a game of tag, with a new sense of discovery and courage! We have a new fun way of dealing with bumps and bruises- " look mommy at all my fun" - school has been fun and a joy! She is so smart and has a real eye for detail. We forever are grateful to you and your husband for doing this! ~ Stacy B. "2 months after his brain reorganization exercises, MIRACLES began to happen. Matthew all of a sudden became perfect at the Breast Stroke. His muscles and chest expanded, he grew inches in only a few months, He became so strong in Tae Kwon Do, everyone was shocked. He had tremendous power behind, kicks and punches, He was doing complex kicks high above the Masters head and crossing the mid-line effortless, His hamstrings were so tight and all of a sudden he could touch his toes. He was limber and strong. He excelled and is testing for his Blue Belt this Friday after only 2 months as a green belt. He remembers his forms effortlessly. They asked him to attend higher level classes vs. children's classes. His social skills exploded. He is making friends. I no longer have to talk for Matthew. He is taking initiative for himself and independence. He is making me and others laugh constantly. Matthew could only draw stick men, but now he was doing 3 dimensional pictures that were very advanced, with personal style. Unbelievable, for only 2 or 3 months. Just this week his reading and writing teacher said, " Matthew you shouldn't be in the self contained class anymore you are writing, your reading comprehension is too advanced for this class." Matthew said he now understands the algebra in his self contained math class. "It all of a sudden makes sense. Isn't that weird Mom!" Very often after brain reorganization exercises Matthew starts to draw or write complex stories for fun." My husband and I attended the Connections Seminar in Fredricksburg at the end of January earlier this year. We were in hopes of helping our 12 year old son Sam speak coherently without repeating his words over and over and hardly ever finishing a sentence. He struggled with writing, social skills, and an awkwardness with his body positions and motions too. We didn't bother to diagnose him with any specific neurological disorder because I have always home schooled him. During the seminar, my husband and I both realized that all of our six children might benefit from the brain development exercises, not only Sam. Our son Sam also has auditory processing issues due to heavy antibiotics as an infant under a year, and eventually ear tube surgery at only 7 months old. That is why Sam's problems were noticeable, and the others' not so much a problem. After a few weeks, Sam had a noticeable change in his speech. He was not repeating words and could get a whole sentence out. He was finally talking! He holds his head up instead of bent over. His writing skills and socials skill need to be developed now that they can be, and it seems his motivation to work has improved. Sam is still a work in progress, but his body positions have improved dramatically. Our 9 yr. daughter had always struggled to be able to steer her bike and had given up trying. I asked her to try again wondering if the exercises might have helped her, and the first bike ride we went on, she steered perfectly and even exclaimed, "Mom, I loved it!" She has been biking a ton ever since. She also had a "lazy" eye problem that has gone away now. Our 7 yr. son and 6 yr. daughter both improved in their Irish dancing ability. They looked pretty awkward and didn't stay with the music in late January. When I saw them dance again in March, their timing and ability had greatly improved. Johnny is 5 years old and has done the Connections movements for several months. His mother writes, "I was concerned because he was extremely passive and very sensitive to sound. He had poor coordination, cried often and was always getting his feelings hurt. Johnny was also easily embarrassed, had low self esteem and pronunciation difficulties. He had no self confidence." "My husband and I thoroughly enjoyed the Connections seminar! I teared up a few times during the presentation simply because I am so happy to finally have hope! It was strongly suggested my son take medicine for ADHD, but I have resisted because of the side effects. I would rather fix the issues than put a band aid on them, and I feel like we are on our way to doing just that. It would be my dream to see this program incorporated into every daycare, pre school, and gym class so kids could start becoming all that God intended them to be." Jennifer C.
"Twelve year old Max has autism and anxiety issues. He is committed to doing the connections movements daily and challenges himself to do more each week. After 2 weeks of exercises, he was calmer, less reactive in his therapy session and had 2 weeks of success at school keeping himself calm. He still had a little problem calling out in class but his mother said she hadn’t had a call from school in 2 weeks which was a relief to her. Max's mother also said that in baseball he is able to accept not being chosen or when he does strike out he doesn’t “lose it" on the field. Thank you for the Connections exercises! They add a piece to my practice that I have always known was missing but didn’t quite know what to do." ~Kate B., Certified Mental Health Counselor and Therapist. 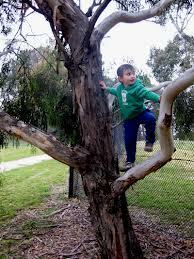 "Jordan has been climbing everything in sight! He's climbing every tree in our backyard...this is our formerly afraid of heights guy. Things took off once I realized one day, hey, climbing is just like doing our Connections movements. He now loves to climb higher than our heads and gets a kick out of being taller than us!" "Jordan took his first shower with wax ear plugs, mind you, but ever since then he's never wanted to take a bath again! Now he wants to do it "by myself" and two days ago he took a shower without the earplugs! I help him with washing his hair so he doesn't get the soap in his eyes, and provide a few instructions as I watch through the frosty glass, but that's it! Oh, and after he's done washing, he likes to "dance" in the water for a minute or two before he gets out! The noisy water does not bother him anymore." "Jordan still hasn't wet the bed since he's been doing the movements... some time ago he did wet the bed 2 nights in a row during the stint where we didn't do movements. Now, even if we miss a day or two he still stays dry. I believe his brain is getting fully connected. About the meltdowns - he is able to calm down/recover MUCH quicker, and the tantrums are not as explosive. The longer we do the movements and the more consistent we are, the farther we seem to get from the thrashing body type tantrums! I'd say we're doing the whole regiment 3-4 days a week." Please send me free information. Your personal information will never be shared.